Published: Oct. 28, 2018 at 01:42 p.m.
Cleveland Browns defensive back Derrick Kindred intercepts a throw by Pittsburgh Steelers quarterback Ben Roethlisberger that was tipped in the air. Published: Oct. 21, 2018 at 02:32 p.m. 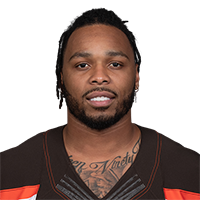 Published: Oct. 21, 2018 at 02:25 p.m.
Cleveland Browns linebacker Christian Kirksey intercepts an underthrown pass from Tampa Bay Buccaneers quarterback Jameis Winston. Published: Nov. 19, 2017 at 03:18 p.m.
Cleveland Browns defensive lineman Myles Garrett recovers the loose fumble from jaguars QB Blake Bortles forced by defensive back Christian Kirksey.